Just the one, but it was fun. 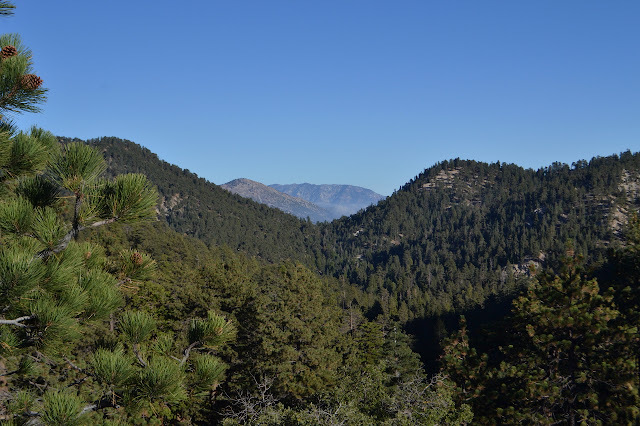 Peaks and trees along the view to Cucamonga Peak. It is National Public Lands Day and that means there are many volunteer opportunities all over the forests, parks, and even BLM areas. Oh, and probably a few conservancy areas as well as city and county parks. It is also a fee free day on federal lands and whoever else is participating in fee free days. The gas to get to anything charging a fee and participating in the fee free day that is seems a bit silly to try to enjoy just one particularly crowded day once there. So, I am out to join a volunteer effort. Our Wednesday night sojourns up Tunnel Trail have shown that the brush is getting quite tight, so I went for the closest one which would set about fixing that. 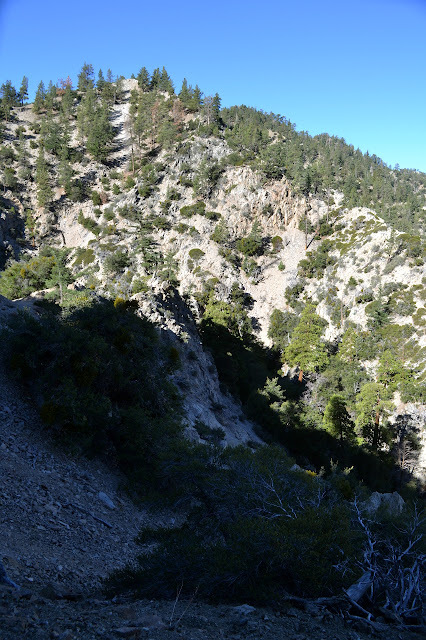 The typical Tunnel Trail view down the canyon and over the city. I can see the hill behind the house from here! Today, city and county parks seem to be in charge. We do not have any advantages in getting parking today, but once at the gate, we do get to hop into vehicles and go on up to where the catway splits just short of where the trail starts up as a single track. It is nice to skip the paved mile at the bottom. After a safety talk, we grab tools and head on up. There are only about 20 today, so we split into 2 groups to tackle the brush and tread of this trail. 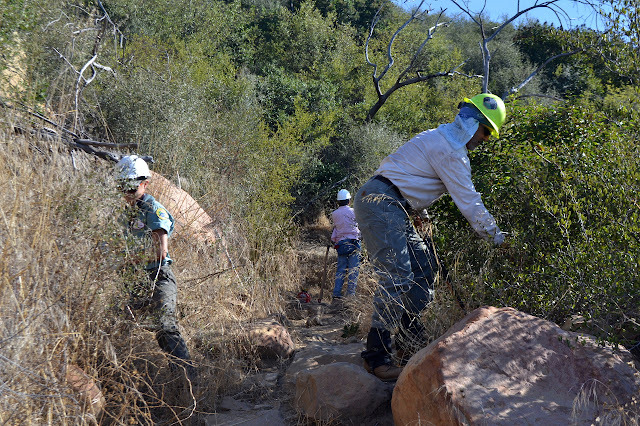 A couple volunteers tackle the brush while one takes on the tread. Gordon has been improving trail all week, but is still out here on his day off! I have to admit that I tend to think the tread of these front country trails is a lost cause. There are places where you are walking up through a 4 foot deep ditch along these. Those spots are rather unimprovable, but above and below them there is often something that can be done. 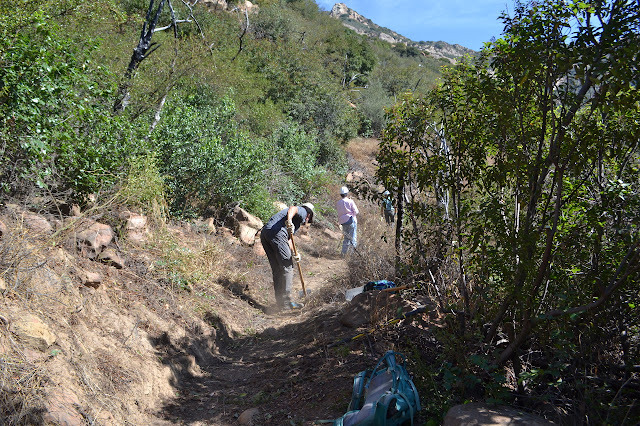 Jesusita Trail next door had some new drainage carved out just before the last rains and they seem to have worked wonders on it. Certainly we can try on Tunnel too. Marked for deletion. Trail paint in a semi-circle marks a spot to add drainage to a bit of trail that is currently catching water. We do not want this to become another 4 foot deep trench. Perhaps not so noticeable from this angle, but the grass and berm on the outside has been knocked away and a semi-circle dip carved out to gently encourage the water to flow off the trail instead of down it. Even with the rather drastic needs for better drainage, we can not ignore the tight brush. We have a couple gas powered trimmers to go after the grasses and small brush around the trail, but mostly is is cut with loppers. First cleaning out the little stuff with a gentle and noisy sweep. Somewhat a before picture for the next, but I forgot where exactly I had done the first. A bit of trail that is basically done. The sumac was reaching into the tread and now it has a few feet clearance. For my part, I get to take a few cuts at the trail. Mostly, I end up tossing huge piles of cut brush off the trail. Gordon has brought along a very nice geared lopper and can get through stuff I would need to get out the saw for, so it is just sensible to clear it out so he can cut more of that. It actually seems to be the majority of the stuff along the side. 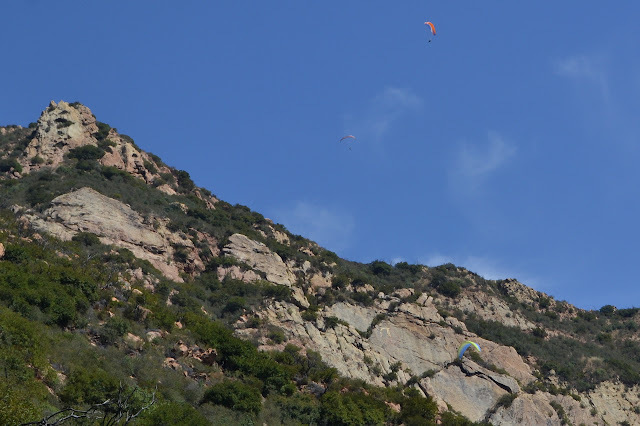 Some paragliders to watch as the day turns to afternoon. We saw 4 (only 3 pictured), including this one that is drifting a bit close to the rocks. Down at the finish, we do actually get a sort of payment. There are big sandwich, chips, cookies, and soda to be had. 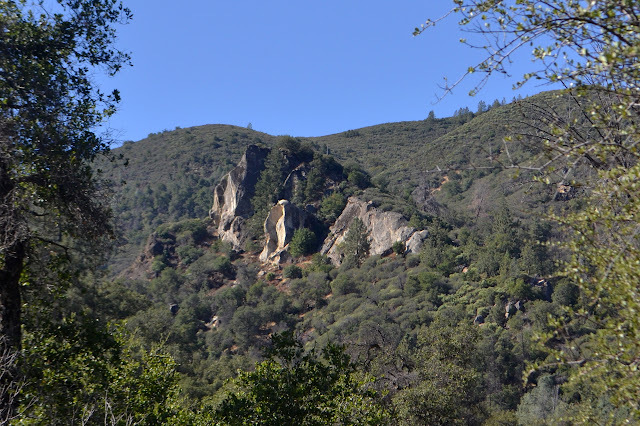 The weekend comes with an offer of led hikes by the Sierra Club for all who show up at the Bank of America at State and Hope by 9 AM, except for the occasional missed day or early meet time. 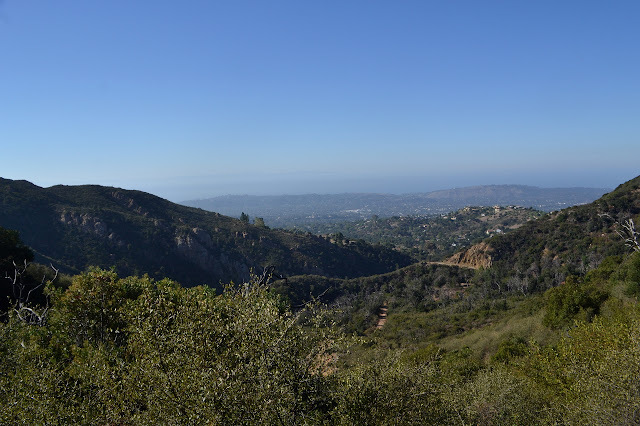 (The hikes are listed here, here, or here.) I decided to take them up on the offer. Today is an early meet time because the drive out to Figueroa Mountain is a bit long, but it is not so hard to get out somewhere by 8 AM. The group numbered 10 as we headed out and still did when we got to the trailhead in the tough part of Davy Brown Campground. It is so tough, in fact, that we were asked to park in a somewhat different spot by the current occupants of the last camp site so they could use the parking area instead of the road as an exit route. They did not like their chances with the road, which was surprising considering the cavernous clearance the pickup had. We reparked and they were happy and so we could head out down the rest of the increasingly rough road to the creek where it vanishes except for one last indication in the form of a gate on the far side. We slip through it and there is clear trail ahead. 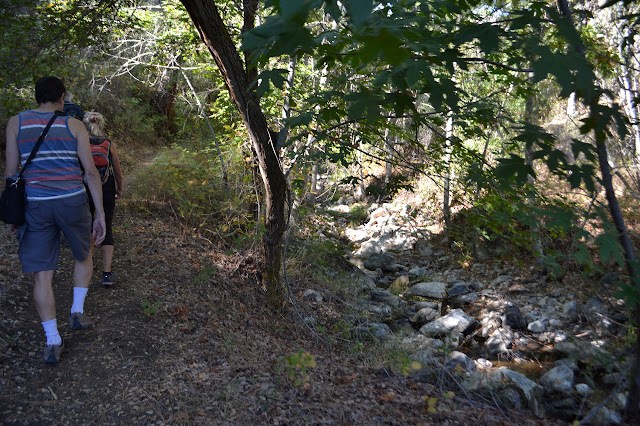 We crossed Munch Canyon and walk up along Davy Brown Creek. It has a nice little flow today. Interesting rocks high up the canyon show in an open spot. 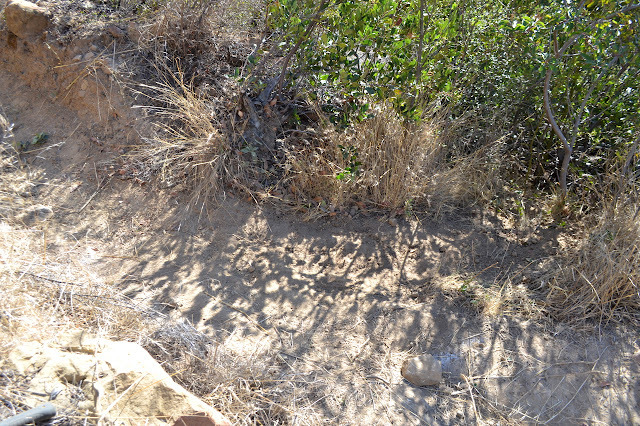 The trail is a little high on the side of the creek, so it is hard to notice what happened to the water. For a bit, it is quiet. 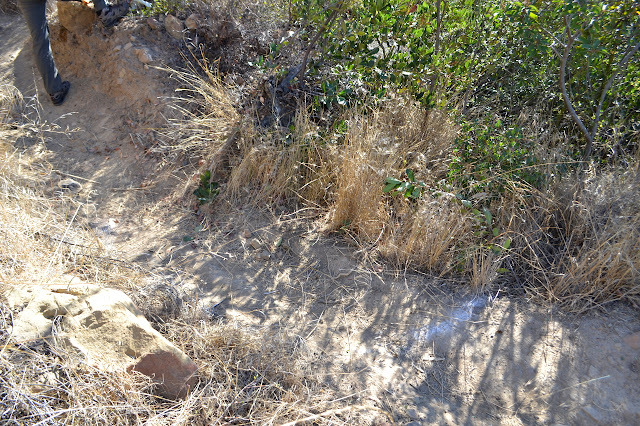 Parched rocks are visible in one spot. I hung around the area to go climbing one more peak in the morning. Very early in the morning, I noticed my stars vanishing, and by sun up they seemed to be doubly gone with the slightest bit of moisture coming down. The weather has changed. 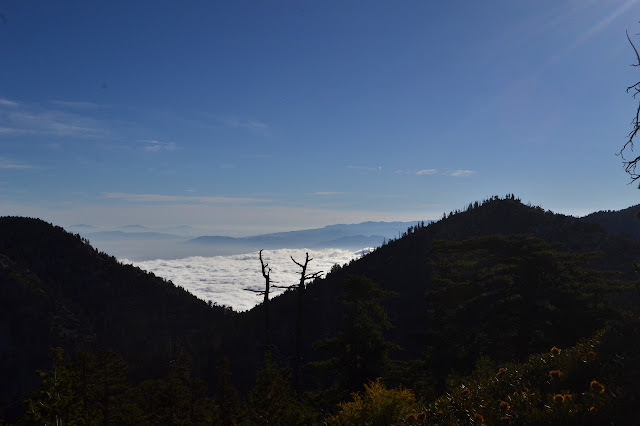 Traveling to my planned hike, there was a moment looking out over the clouds, which was quite nice, but then I was back in them. At the trailhead, I seem to be under them ever so slightly. I live in hope as I stuff puffy things and the emergency poncho into the pack in case things get quite cold and wet. Maybe this peak is high enough for that over the clouds view. Signage at this trailhead in the middle of the Silver Moccasin Trail. This is not the shortest route to the peak, but it is the shortest drive. The trail gets on with climbing quite quickly with a few switchbacks. What I can see of the view is surprisingly colorful, full of all different reds and greens surrounding grey rocks. All too quickly, I plunge into the cloud above. Manzanita, buckwheat, pine trees, and coyote bush all add their colors to rocks that are not entirely without color themselves. The trail in this section is quite well worn. There is still enough light left for something, at least for a silly little thing like Mount Akawie, AKA Buckhorn Peak. 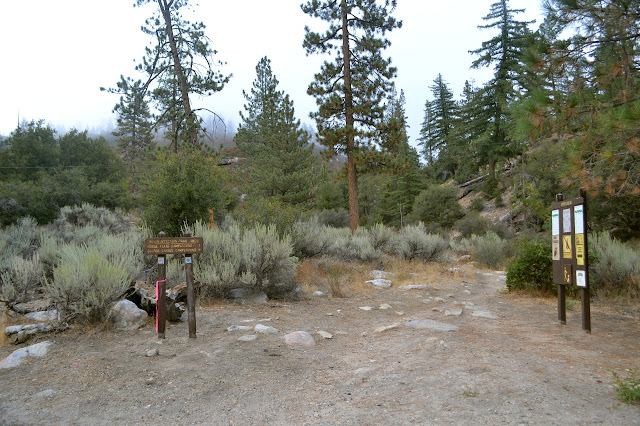 It rises a little above the campground and is most easily accessed by a road east of Cloudburst Summit and west of the picnic area. It does not seem to appear on maps and is blocked by a thin yellow gate. The spot has a huge parking area for those times when there is a grand party up on the peak, I suppose. 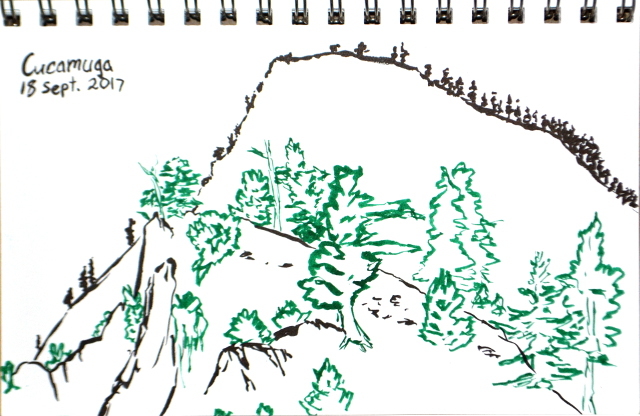 For no good reason, I want to go up the little peak west of the main peak as well, so although the road is wide and easy and clearly the main route, I scramble upward to follow the ridge. Getting high for a view, a peek at peaks east through a wide gap. They do tend to be taller over there. In the small saddle before the little peak, there is a scattering of weathered planks. It looks rather like there was once a simple structure in the somewhat flat area. A scattering of random planks is not all that unusual. 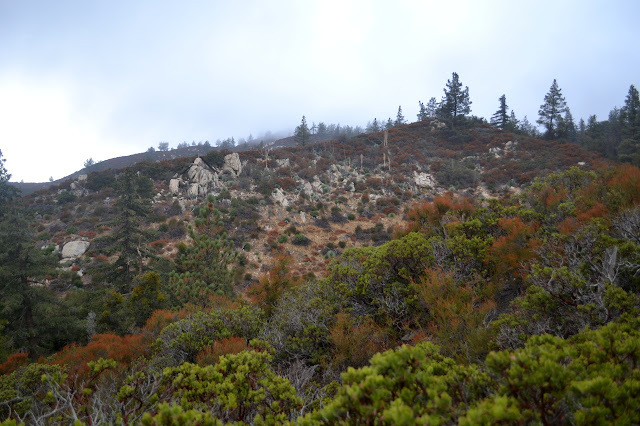 The peak itself is a rocky outcrop in the trees. It has no views except down its sides where there is quite a bit more evidence of old buildings that were less simple. Some anchors of concrete and stone and metal beside another rock outcrop down the north side of the little peak. A new day and new peaks to bag, but this time I will join a planned outing of the Hundred Peaks Section for some company. 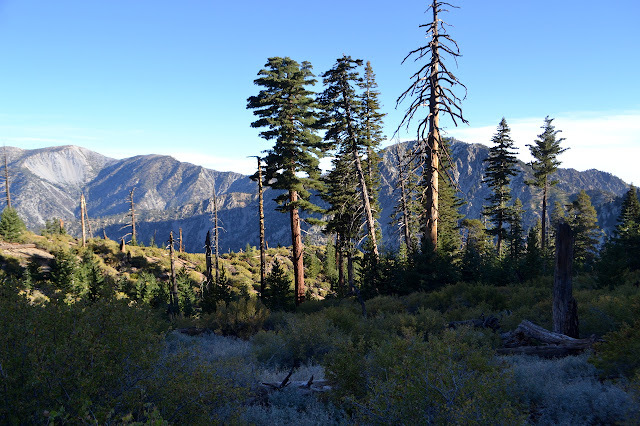 I have been really wanting to do the traverse of Pleasant View Ridge from Burkhart Saddle to the other side of the closed bit of the Pacific Crest Trail, especially if there is going to be a car shuttle. Unfortunately, this is not that. This is heading up to the saddle and then turning the other way to grab a couple nearby peaks. Still, it gets me into an area I have enjoyed visiting before, then out to some new spots. 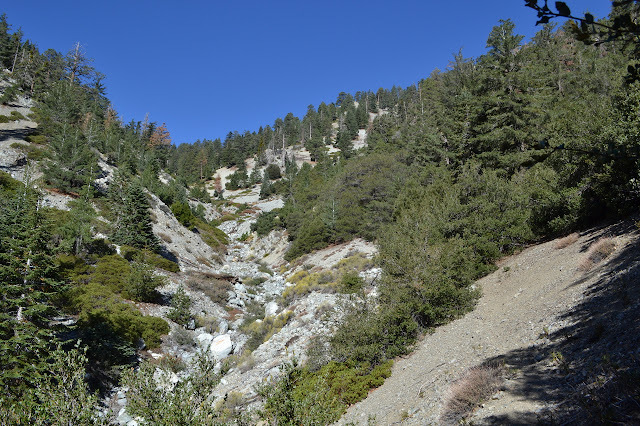 First, it is a little over a mile downhill on well used trail to Cooper Canyon, past various falls and with the sun thinking about getting down into the depths of the canyon. 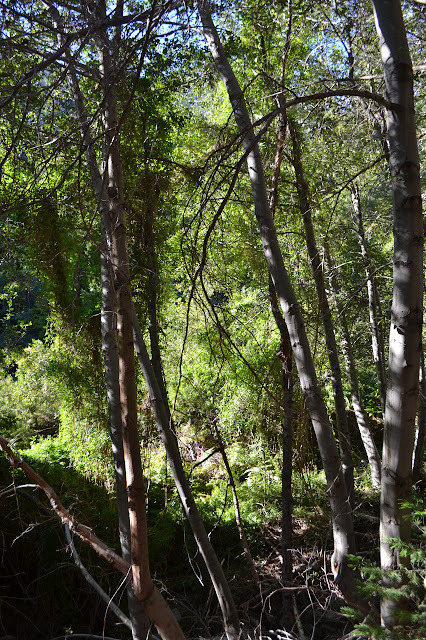 There is a lot of vertical to the land as Cooper Canyon empties out into Little Rock Creek. Past the Cooper Canyon waterfall that marks the end of previous exhibitions in this direction, the trail just drifts downward above the creek. Eventually it gets down and crosses water is flowing the wrong way. We were following down the creek, but suddenly we have been going up the creek. It is just Little Rock Creek after Cooper Canyon joined it not too long before. 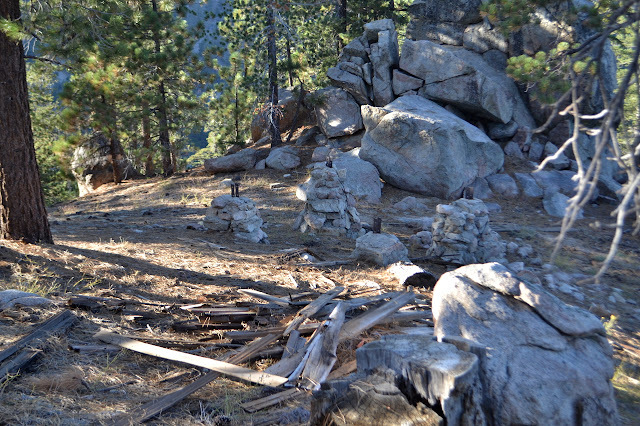 On the far side, a slapstick with a PCT crest points up the creek along a deteriorated trail. It follows Rattlesnake Trail past Rattlesnake Spring, which has been temporarily closed for since Dec. 2005 to protect mountain yellow-legged frogs. The Forest Service teases us with plans of this opening again, but the current Williamson Rock Area Closure Order goes until Dec. 31, 2018. The rock climbers seem to be the most disappointed by the ongoing closure as Williamson Rock is apparently an absolutely lovely piece of granite with all levels of exciting routes up it. 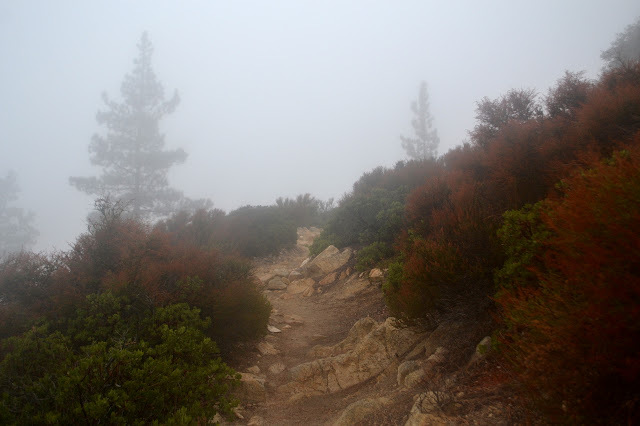 It is probably a rather low point in the PCT hiker experience as well. We have hit our lowest point in a more literal way and start to climb continuing on Burkhart Trail. There is something a bit nuts about the canyon we slowly pass by. The light is not yet right to really take in the landscape, but the textured bits are interesting. We hike deep into the folds of the mountain as we climb, sometimes in the wrong direction. At one ridge, some discuss the route up to Goodykoontz Peak. It is a steep and crumbling mess. I wonder why they would want to go up that and get told that it is better than coming down it. I have to give them that. That is for next week. One crease looks like it was once a good place for cedar trees, but the large shapes stand dead now. A change in water or passing of fire? I am suspicious it is the first although the second would not have helped. We keep on climbing to the saddle and new views. 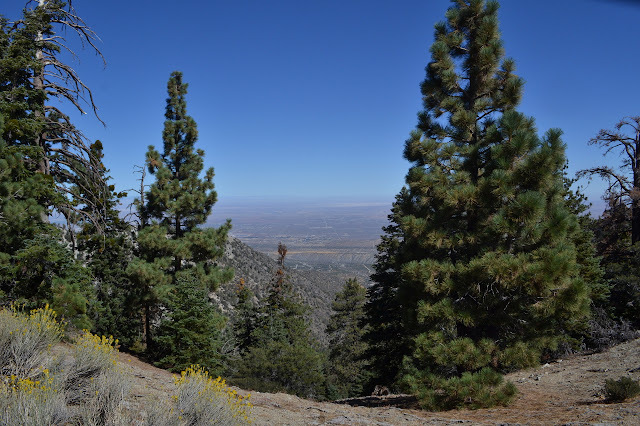 The view of the desert from Burkhart Saddle is somewhat obscured by trees. Although 2000 feet higher, Kelly Camp was not much cooler than Commanche Camp the night before. I pack up and tuck my gear away. This place does not have anything like the traffic at Icehouse Saddle, so I am not as worried about getting it totally hidden. Heading up the old camp steps along the trail gets me out of came and climbing to the ridge. In between is an area where burn and regrowth has left a trail that circles about in ridiculous ways. 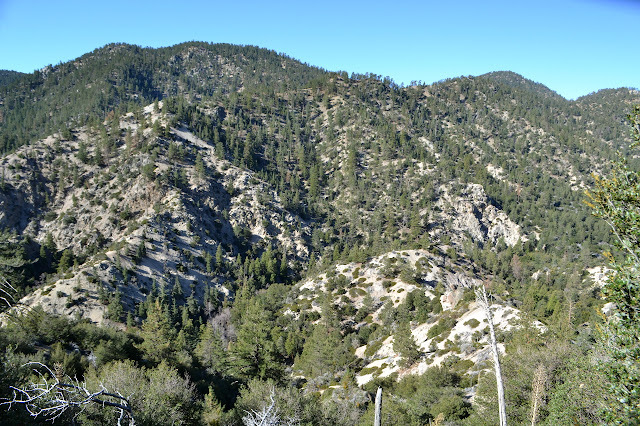 Looking north to Timber Mountain and Mount San Antonio. At the top of the ridge, it shows an advantage of saving these peaks with a similar view for a new day. It is a whole new world down there today compared to yesterday. The city grid stretching far west and east is now gone in favor of a sea of clouds with a few islands. There were vast connected cities here before and now there is just Santiago Peak in the distance. Trail at the top follows near the ridge east and west. I turn west for Ontario Peak. 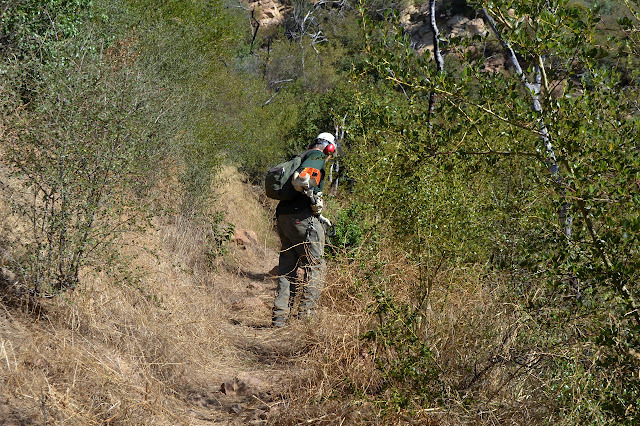 The trail follows through more of the burn, but now plots a typical ridge line path. It stays generally to the north side just a little and avoids going up and over the biggest bumps on the way. Even the spaces to the east, seen through Icehouse Saddle here, are covered in fog. The night was about as cool as my sleep system could go without a little help, but I did not have to sacrifice my pillow for the warmth of the jacket within it. Bright stars shone through the breaks in the trees when I looked. 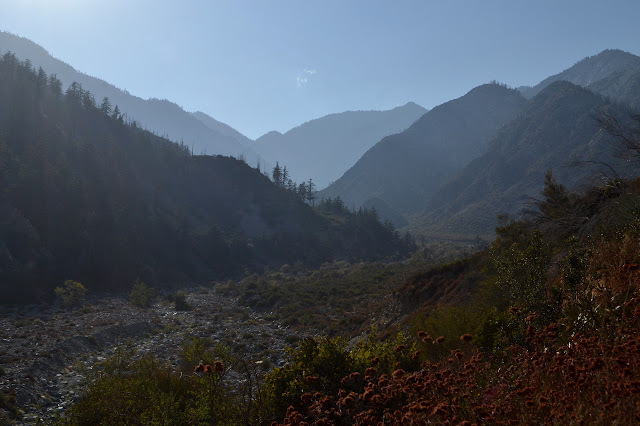 Today, there are mountains to climb and then a stop at Kelly Camp before climbing some more. I expect the established camp probably has a spring associated with it, but there is certainly no water source to be seen on my map. The rangers at the station googling were able to find the suggestion this may be true and that it was dry in May. For a stream, that would be damning, but springs run on their own offset schedule. Not knowing where to find it, I really need to get water where it is known. That means either here and carry it up 2000 feet or from a spring on the other side that is out of my way, but only 1000 feet below the saddle. The 30 feet of surface water making lovely music beside me wins out. One bag for hiking, one for camping, and one for hiking again. Just 15 pounds of water. Glad I did not need to add in things like rain gear or a tent for this trip. A little bit of quiet water between musical dribbles in this brief moment that it rises to the surface. The trail up from beside the water is not so hard to follow in the day. It simply has some bushes reaching across it. I break a few of the larger branches as I pass. After about 200 feet, there are more flat spots and these have fire rings. I was very nearly in the camp after all. Past Third Crossing, the trail had seemed a bit less used. The same holds here. There are more spots with brush reaching across and quite a few fallen logs, some with rather awkward routes around them. Everything seems to turn green and there is a larger sound of water after a quarter of a mile, so I did have another chance for it. There does not seem to be any established route to get down the last few feet to this water, though. Trees as things become a bit of a jungle. 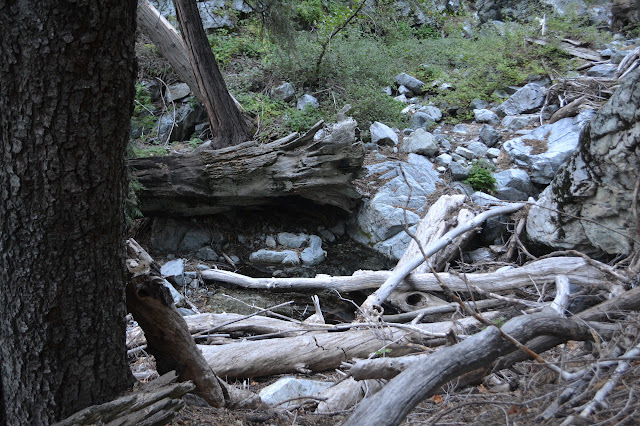 The creek above is so dry it resembles bleached white bones in the desert. 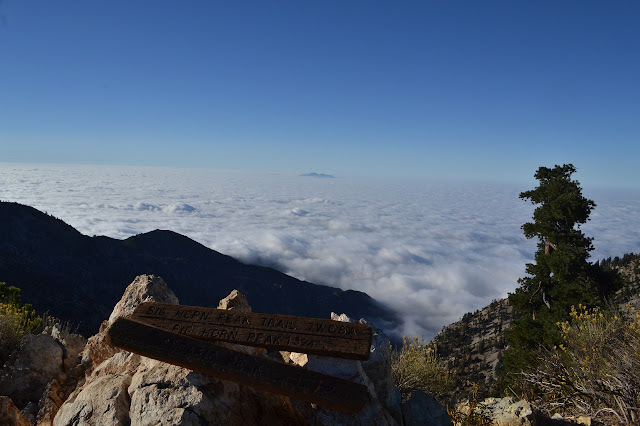 It is beginning to look a little cooler out there and I decided I would brave the weather down south, at least up high in the San Gabriel Mountains. There are plenty of peaks up around Icehouse Saddle that I have not bagged yet and it is an extra nice hike, so I decided I would do that. I also have a memory of one early May many years ago when I came out to backpack up Icehouse Saddle and out to one of the two campsites within two miles of it, however when we got to the ranger station, we were told that the trail was mostly clear up to the saddle, but everything else was under two feet of snow. It is funny how a lurking memory of unrealized planning can motivate one. Still, in the name of going for something new, I decided to come up to Icehouse Saddle from the east instead of the west. In researching that route, I found that someone has put two night caches along the trail between Third Crossing and Commanche. That is quite a curiosity, so I planned to be getting to Third Crossing around dark to try to find those. It is a little harder to get up to Icehouse from the east than the west. 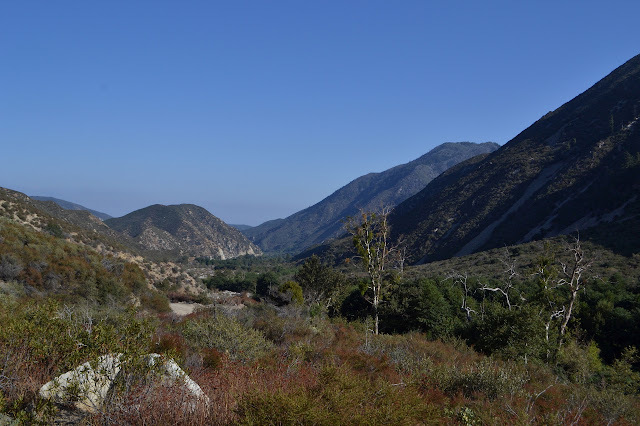 For either way, a permit is required to enter the Cucamonga Wilderness even for day hiking. On the west, day hikers can use a self issue system, but I believe backpackers must get something from the ranger station which is only open on weekends until 3:30 PM. On the east side, permits must come from the ranger station, but it is open Thursday through Monday until 4:30 PM, so it is easier to find the ranger station open. Once the permit is obtained, the road is difficult to find. I saw South Fork as I entered Scotland, but not Middle Fork. Coming back, I did find it. It looks like an ally serving about four homes and the sign is up against some bushes so that it cannot be seen going the other way, but it was the next one after South Fork. This road is generally a very nice road at the moment, but it has a couple spots that are so bad the ranger coming out felt the need to stop me to tell me it would be a very bad idea to drive up in my car up and I would have to park in a lot off to the side just past a gate which is only about a half mile up. She also noted that they had had to tow out a Mercedes "with like four inches of clearance like you've got" that hit the oil pan and bled out until the engine seized. Oh, and once I do get up the road, it is still two miles further on this trail than the one from the west to get to the saddle. I got up to the little lot, only about a half mile in and more than 1.5 miles short of the trailhead, and continued on. After all, the road was still looking quite good. Well, there are quite a few sharp rocks that do not look healthy for my tires, but one can generally avoid them. A bit more than a quarter mile later, it did not look so good at all. It looked downright nasty with plenty of parking at the side in a big turnout, so I parked and started walking. Three brown lines on the road told the tale of the exact route the Mercedes had taken. Looking downstream along the Middle Fork. Looking upstream and into the sun and the mountains. There is a thin stream of water coming down that wide wash below. I expected it to be a little warm today, but there is a thick, grey blanket overhead keeping things cool. 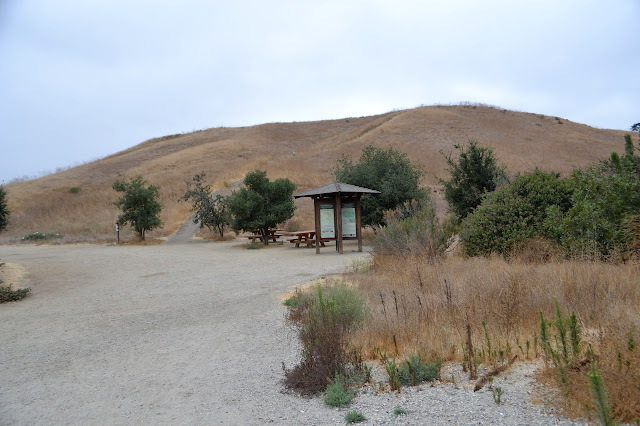 Victory Trailhead is not the closest to the cave and is the only one with a parking fee, but it comes with some signs and picnic tables and a truly disgusting bathroom. It claims to be open sunrise to sunset and has sufficient gating to make it difficult to pass should those get closed. I was able to save the $3 by parking along the nearby street which probably added a quarter mile to the start. Most seem to do this while some go ahead and pay the minor fee. The very well used Victory Trailhead. Starting off, there are a lot of trails to choose from, but only one heading north toward the cave. I turn right to follow it up a short way and then down a long and gentle path. 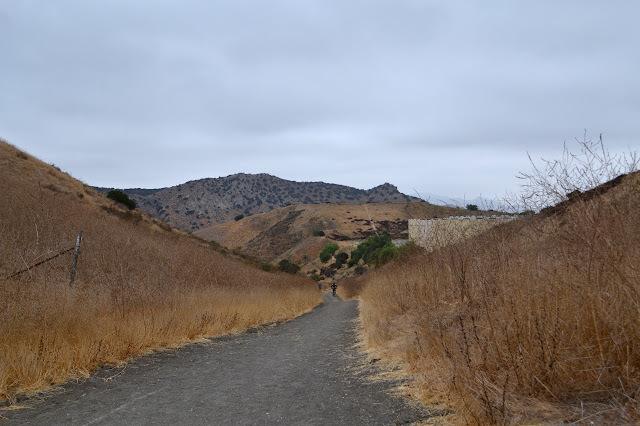 There are many small use trails off to the side going up canyons or ridges. The cave comes into view quickly as the largest of numerous vertical dark spaces in the rocks further north. Following wide trail at the edge of the open space, so some of the views are not entirely open and free of industry. Castle Peak is at the right.